Tired of the same old boring French fries with your meal? Why not make tonight's side dish a little more exciting with these homemade sweet potato steak fries? These thick-cut fries are baked, so they're light and crispy on the outside and perfectly tender on the inside. 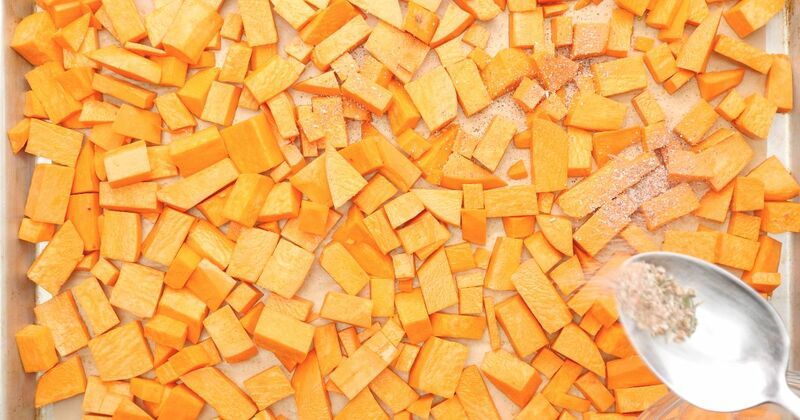 The thickness of these steak fries allows the sweet potato to stand up to longer cooking times and higher temperatures, which cooks the vegetable all the way through and allows you to actually taste the sweet potato. There's a variety of ways to prepare these sweet potato steak fries, from the health-conscious to the, well, not-so-much. The recipe below is a savory baked version, for the most flavor with the fewest calories! 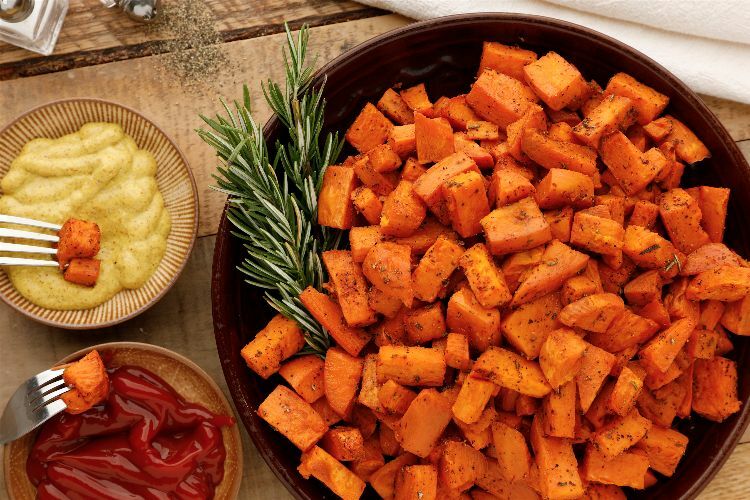 Unlike "normal" potatoes, sweet potatoes have numerous health benefits (high in vitamins A, B6, C, and fiber), and, frankly, taste delicious however you decide to prepare them. They're great to snack on by yourself or to share with family and friends. Preheat oven to 450 F (230 C). Place uncooked potatoes in a large bowl, and add olive oil. Toss the fries by hand to ensure a light but even coating of oil. Line a baking sheet with parchment paper, and place the fries in a single layer on the tray. In a small bowl, combine the salt, pepper, paprika, rosemary, and garlic powder until fully incorporated. Gently sprinkle most of the seasoning mixture over the fries, making sure it sticks to the oil-coated potatoes. Keep a little extra seasoning aside for later. Place baking sheet in the oven and bake fries for approx. 25-30 mins, making sure to flip the fries halfway through. Test for "doneness" by piercing a fry with a fork. If the fork goes in and out easily, they are ready. Once crispy and fully cooked, remove tray from oven and immediately sprinkle the rest of the seasoning mixture over the hot fries (to taste). Allow to cool for 3-5 mins, and enjoy them hot. Pro-tip: For a sweeter version, replace the olive oil for melted butter, and the seasoning mixture for cinnamon and sugar. Pro-tip: For a healthier version, leave the sweet potato skin on. More fiber and potassium, and adds a rustic look. There's something about a hot bowl of soup and thick bread that makes the world feel just a little brighter. Whether you're dealing with heartbreak, trouble at work or you just need to unwind, grabbing a comforting bowl of soup is just the ticket.